NETWORK UPDATE: The unstoppable EMPIRE gained another 0.1 in final numbers, putting it at an astonishing 4.8. It took AMERICAN IDOL along for a 0.1 boost of its own, and ARROW had an extra 0.1 as well. The rest of the adjustments were less pleasant, with 0.1 drops for THE GOLDBERGS, BLACK-ISH, THE MENTALIST, CRIMINAL MINDS, THE MYSTERIES OF LAURA and THE 100. DUCK DYNASTY continued its hold on Wednesday cable, up a big 0.17 to 0.92 for A&E. Lead-outs WAHLBURGERS and DONNIE LOVES JENNY were also way up, respectively by 0.23 to 0.75 and by 0.14 to 0.56. THE GAME (BET) was up 0.08 to 0.81, while IT’S A MANN’S WORLD benefitted greatly from being GAME’s lead-out rather than lead-in, leaping 0.21 to 0.50. ESPN’s NBA doubleheader was at 0.69/0.65, up 0.04/0.18 from last week’s games. On Lifetime, LITTLE WOMEN LA gained a tenth to 0.67, and BIG WOMEN BIG LOVE dipped 0.02 to 0.33. Discovery’s DUAL SURVIVAL was steady at 0.64. On VH1, MOB WIVES lost 0.04 to 0.60, and HINDSIGHT ticked down 0.01 to 0.14. On Comedy Central, WORKAHOLICS was also down a tick to 0.48, and BROAD CITY slipped 0.02 to 0.47. On History, AMERICAN PICKERS rose 0.02 to 0.46. SUITS (USA) lost 0.09 to 0.45. 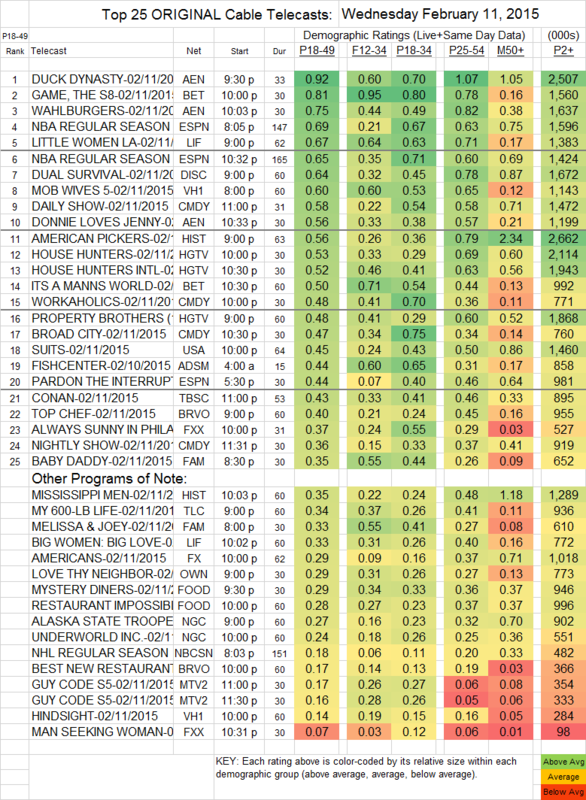 On Bravo, TOP CHEF fell 0.02 to 0.40, and BEST NEW RESTAURANT remained at 0.17. On ABCFamily, MELISSA & JOEY dropped 0.06 to 0.33, and BABY DADDY was up 0.06 to 0.35. LOVE THY NEIGHBOR (OWN) shed 0.04 to 0.29. THE AMERICANS (FX) continued dropping, down 0.06 to 0.29. On FXX, IT’S ALWAYS SUNNY IN PHILADELPHIA was up 0.01 to 0.37, but MAN SEEKING WOMAN slumped, down 0.06 to 0.07. SCHITT’S CREEK (POP) (not on the chart) premiered at 0.04 in 18-49s, with 275K total viewers.